Obama’s certainty was echoed at the time by Denis McDonough, his chief of staff, who told the New York Times: ‘No one with whom I’ve spoken doubts the intelligence’ directly linking Assad and his regime to the sarin attacks. But in recent interviews with intelligence and military officers and consultants past and present, I found intense concern, and on occasion anger, over what was repeatedly seen as the deliberate manipulation of intelligence. One high-level intelligence officer, in an email to a colleague, called the administration’s assurances of Assad’s responsibility a ‘ruse’. The attack ‘was not the result of the current regime’, he wrote. A former senior intelligence official told me that the Obama administration had altered the available information – in terms of its timing and sequence – to enable the president and his advisers to make intelligence retrieved days after the attack look as if it had been picked up and analysed in real time, as the attack was happening. The distortion, he said, reminded him of the 1964 Gulf of Tonkin incident, when the Johnson administration reversed the sequence of National Security Agency intercepts to justify one of the early bombings of North Vietnam. The complaints focus on what Washington did not have: any advance warning from the assumed source of the attack. The military intelligence community has for years produced a highly classified early morning intelligence summary, known as the Morning Report, for the secretary of defence and the chairman of the Joint Chiefs of Staff; a copy also goes to the national security adviser and the director of national intelligence. The Morning Report includes no political or economic information, but provides a summary of important military events around the world, with all available intelligence about them. A senior intelligence consultant told me that some time after the attack he reviewed the reports for 20 August through 23 August. For two days – 20 and 21 August – there was no mention of Syria. On 22 August the lead item in the Morning Report dealt with Egypt; a subsequent item discussed an internal change in the command structure of one of the rebel groups in Syria. Nothing was noted about the use of nerve gas in Damascus that day. It was not until 23 August that the use of sarin became a dominant issue, although hundreds of photographs and videos of the massacre had gone viral within hours on YouTube, Facebook and other social media sites. At this point, the administration knew no more than the public. The administration’s tone had hardened by 27 August, when Jay Carney, Obama’s press secretary, told reporters – without providing any specific information – that any suggestions that the Syrian government was not responsible ‘are as preposterous as suggestions that the attack itself didn’t occur’. On 29 August, the Washington Post published excerpts from the annual budget for all national intelligence programmes, agency by agency, provided by Snowden. In consultation with the Obama administration, the newspaper chose to publish only a slim portion of the 178-page document, which has a classification higher than top secret, but it summarised and published a section dealing with problem areas. The Post report also provided the first indication of a secret sensor system inside Syria, designed to provide early warning of any change in status of the regime’s chemical weapons arsenal. The sensors are monitored by the National Reconnaissance Office, the agency that controls all US intelligence satellites in orbit. According to the Post summary, the NRO is also assigned ‘to extract data from sensors placed on the ground’ inside Syria. The former senior intelligence official, who had direct knowledge of the programme, told me that NRO sensors have been implanted near all known chemical warfare sites in Syria. They are designed to provide constant monitoring of the movement of chemical warheads stored by the military. But far more important, in terms of early warning, is the sensors’ ability to alert US and Israeli intelligence when warheads are being loaded with sarin. (As a neighbouring country, Israel has always been on the alert for changes in the Syrian chemical arsenal, and works closely with American intelligence on early warnings.) A chemical warhead, once loaded with sarin, has a shelf life of a few days or less – the nerve agent begins eroding the rocket almost immediately: it’s a use-it-or-lose-it mass killer. The sensors detected no movement in the months and days before 21 August, the former official said. It is of course possible that sarin had been supplied to the Syrian army by other means, but the lack of warning meant that Washington was unable to monitor the events in Eastern Ghouta as they unfolded. The sensors had worked in the past, as the Syrian leadership knew all too well. Last December the sensor system picked up signs of what seemed to be sarin production at a chemical weapons depot. It was not immediately clear whether the Syrian army was simulating sarin production as part of an exercise (all militaries constantly carry out such exercises) or actually preparing an attack. 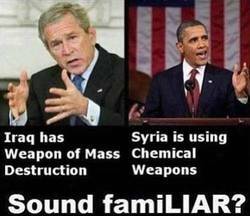 At the time, Obama publicly warned Syria that using sarin was ‘totally unacceptable’; a similar message was also passed by diplomatic means. The NSA would of course monitor Assad’s office around the clock if it could, the former official said. Other communications – from various army units in combat throughout Syria – would be far less important, and not analysed in real time. ‘There are literally thousands of tactical radio frequencies used by field units in Syria for mundane routine communications,’ he said, ‘and it would take a huge number of NSA cryptological technicians to listen in – and the useful return would be zilch.’ But the ‘chatter’ is routinely stored on computers. Once the scale of events on 21 August was understood, the NSA mounted a comprehensive effort to search for any links to the attack, sorting through the full archive of stored communications. A keyword or two would be selected and a filter would be employed to find relevant conversations. ‘What happened here is that the NSA intelligence weenies started with an event – the use of sarin – and reached to find chatter that might relate,’ the former official said. ‘This does not lead to a high confidence assessment, unless you start with high confidence that Bashar Assad ordered it, and began looking for anything that supports that belief.’ The cherry-picking was similar to the process used to justify the Iraq war. The White House needed nine days to assemble its case against the Syrian government. On 30 August it invited a select group of Washington journalists (at least one often critical reporter, Jonathan Landay, the national security correspondent for McClatchy Newspapers, was not invited), and handed them a document carefully labelled as a ‘government assessment’, rather than as an assessment by the intelligence community. The document laid out what was essentially a political argument to bolster the administration’s case against the Assad government. It was, however, more specific than Obama would be later, in his speech on 10 September: American intelligence, it stated, knew that Syria had begun ‘preparing chemical munitions’ three days before the attack. In an aggressive speech later that day, John Kerry provided more details. He said that Syria’s ‘chemical weapons personnel were on the ground, in the area, making preparations’ by 18 August. The government assessment and Kerry’s comments made it seem as if the administration had been tracking the sarin attack as it happened. It is this version of events, untrue but unchallenged, that was widely reported at the time. An unforeseen reaction came in the form of complaints from the Free Syrian Army’s leadership and others about the lack of warning. ‘It’s unbelievable they did nothing to warn people or try to stop the regime before the crime,’ Razan Zaitouneh, an opposition member who lived in one of the towns struck by sarin, told Foreign Policy. But since the American press corps had their story, the retraction received scant attention. On 31 August the Washington Post, relying on the government assessment, had vividly reported on its front page that American intelligence was able to record ‘each step’ of the Syrian army attack in real time, ‘from the extensive preparations to the launching of rockets to the after-action assessments by Syrian officials’. It did not publish the AP corrective, and the White House maintained control of the narrative. So when Obama said on 10 September that his administration knew Assad’s chemical weapons personnel had prepared the attack in advance, he was basing the statement not on an intercept caught as it happened, but on communications analysed days after 21 August. The former senior intelligence official explained that the hunt for relevant chatter went back to the exercise detected the previous December, in which, as Obama later said to the public, the Syrian army mobilised chemical weapons personnel and distributed gas masks to its troops. The White House’s government assessment and Obama’s speech were not descriptions of the specific events leading up to the 21 August attack, but an account of the sequence the Syrian military would have followed for any chemical attack. ‘They put together a back story,’ the former official said, ‘and there are lots of different pieces and parts. The template they used was the template that goes back to December.’ It is possible, of course, that Obama was unaware that this account was obtained from an analysis of Syrian army protocol for conducting a gas attack, rather than from direct evidence. Either way he had come to a hasty judgment. Still, the New York Times seized on the report, as did American and British officials, and claimed that it provided crucial evidence backing up the administration’s assertions. An annex to the UN report reproduced YouTube photographs of some recovered munitions, including a rocket that ‘indicatively matches’ the specifics of a 330mm calibre artillery rocket. The New York Times wrote that the existence of the rockets essentially proved that the Syrian government was responsible for the attack ‘because the weapons in question had not been previously documented or reported to be in possession of the insurgency’. Theodore Postol, a professor of technology and national security at MIT, reviewed the UN photos with a group of his colleagues and concluded that the large calibre rocket was an improvised munition that was very likely manufactured locally. He told me that it was ‘something you could produce in a modestly capable machine shop’. The rocket in the photos, he added, fails to match the specifications of a similar but smaller rocket known to be in the Syrian arsenal. Postol, who has served as the scientific adviser to the chief of naval operations in the Pentagon, said that the assertions in the Times and elsewhere ‘were not based on actual observations’. He concluded that the flight path analyses in particular were, as he put it in an email, ‘totally nuts’ because a thorough study demonstrated that the range of the improvised rockets was ‘unlikely’ to be more than two kilometres. Postol and a colleague, Richard M. Lloyd, published an analysis two weeks after 21 August in which they correctly assessed that the rockets involved carried a far greater payload of sarin than previously estimated. The Times reported on that analysis at length, describing Postol and Lloyd as ‘leading weapons experts’. The pair’s later study about the rockets’ flight paths and range, which contradicted previous Times reporting, was emailed to the newspaper last week; it has so far gone unreported. The flurry of American interest in al-Nusra and sarin stemmed from a series of small-scale chemical weapons attacks in March and April; at the time, the Syrian government and the rebels each insisted the other was responsible. The UN eventually concluded that four chemical attacks had been carried out, but did not assign responsibility. In other words, the White House had no direct evidence of Syrian army or government involvement, a fact that was only occasionally noted in the press coverage. Obama’s tough talk played well with the public and Congress, who view Assad as a ruthless murderer. Two months later, a White House statement announced a change in the assessment of Syrian culpability and declared that the intelligence community now had ‘high confidence’ that the Assad government was responsible for as many as 150 deaths from attacks with sarin. More headlines were generated and the press was told that Obama, in response to the new intelligence, had ordered an increase in non-lethal aid to the Syrian opposition. But once again there were significant caveats. The statement contradicted evidence that at the time was streaming into US intelligence agencies. Already by late May, the senior intelligence consultant told me, the CIA had briefed the Obama administration on al-Nusra and its work with sarin, and had sent alarming reports that another Sunni fundamentalist group active in Syria, al-Qaida in Iraq (AQI), also understood the science of producing sarin. At the time, al-Nusra was operating in areas close to Damascus, including Eastern Ghouta. An intelligence document issued in mid-summer dealt extensively with Ziyaad Tariq Ahmed, a chemical weapons expert formerly of the Iraqi military, who was said to have moved into Syria and to be operating in Eastern Ghouta. The consultant told me that Tariq had been identified ‘as an al-Nusra guy with a track record of making mustard gas in Iraq and someone who is implicated in making and using sarin’. He is regarded as a high-profile target by the American military. Independently of these assessments, the Joint Chiefs of Staff, assuming that US troops might be ordered into Syria to seize the government’s stockpile of chemical agents, called for an all-source analysis of the potential threat. ‘The Op Order provides the basis of execution of a military mission, if so ordered,’ the former senior intelligence official explained. There is evidence that during the summer some members of the Joint Chiefs of Staff were troubled by the prospect of a ground invasion of Syria as well as by Obama’s professed desire to give rebel factions non-lethal support. In July, General Martin Dempsey, chairman of the Joint Chiefs, provided a gloomy assessment, telling the Senate Armed Services Committee in public testimony that ‘thousands of special operations forces and other ground forces’ would be needed to seize Syria’s widely dispersed chemical warfare arsenal, along with ‘hundreds of aircraft, ships, submarines and other enablers’. A series of secret dispatches from Syria over the summer reported that members of the FSA were complaining to American intelligence operatives about repeated attacks on their forces by al-Nusra and al-Qaida fighters. The reports, according to the senior intelligence consultant who read them, provided evidence that the FSA is ‘more worried about the crazies than it is about Assad’. The FSA is largely composed of defectors from the Syrian army. The Obama administration, committed to the end of the Assad regime and continued support for the rebels, has sought in its public statements since the attack to downplay the influence of Salafist and Wahhabist factions. In early September, John Kerry dumbfounded a Congressional hearing with a sudden claim that al-Nusra and other Islamist groups were minority players in the Syrian opposition. He later withdrew the claim. The UN resolution, which was adopted on 27 September by the Security Council, dealt indirectly with the notion that rebel forces such as al-Nusra would also be obliged to disarm: ‘no party in Syria should use, develop, produce, acquire, stockpile, retain or transfer [chemical] weapons.’ The resolution also calls for the immediate notification of the Security Council in the event that any ‘non-state actors’ acquire chemical weapons. No group was cited by name. While the Syrian regime continues the process of eliminating its chemical arsenal, the irony is that, after Assad’s stockpile of precursor agents is destroyed, al-Nusra and its Islamist allies could end up as the only faction inside Syria with access to the ingredients that can create sarin, a strategic weapon that would be unlike any other in the war zone. There may be more to negotiate. This entry was posted in Military, Obama and Company, Psy-Ops, Region: Middle East, Whistleblowers and tagged obamalies, sarin gas, seymour hersh, snowden, syria gas hoax. Bookmark the permalink. this was well researched, well written…but it seems like you are operating under the assumption/expectation of fair and frank dealings with the actors playing government. Actors who represent a shadow government. NONE of the people mentioned in this report have a thing to do with decisions of a politicians. ..and certainly not a thing to do with the views expressed by a nations willing slaves. An analysis of the overall purposes of these five branches suggests that the overall purpose of the Shadow Government is to exercise covert control by: 1) collecting comprehensive institutional and personal information, 2) by establishing national and international policy independently of the established Government, 3) by developing high-tech arms and equipment, and, with these, establishing small, specialized, highly-mobile, elite military units to effect these covert policies, when need arises, without having to rely on the official (and “unreliable”) Armed Services, (whose subservience to the Shadow Government is reasonably suspect), 4) by developing an armed capability to repel any threat to the status quo, (including the uncertain ontological, social, and economic impacts of any revelation of the reality of UFO and extraterrestrial presence) through the development of a Star Wars/BMDO ground and space-based surveillance and SDI weapons network, 5) by denying information compromising to the Shadow Government from all those outside “need-to-know” policymaking levels, and 6) by exercising control on the money supply, availability of credit, and the worth of money, through policy decisions made outside of the official Government. no doubt, dawn… Hersh is mainstream, but probably considered a maverick within the mainstream. Still, he revealed Obama lies, thru whistleblowers, so we’re grateful for that.